Michael Avenatti plans tour of local prisons to promote NEW show ‘Cellmates’ co-starring Michael Cohen on NBC’s Must See TV lineup! Hollywood is abuzz, both due to abundant prescription medications, AND the FUN, NEW, TV series “CELLMATES!” starring Michael “Flight of Icarus” Avenatti, and his former foe, Michael “Ice Cream” Cohen. The series finds them as unlikely cell-mates in federal prison, who join forces to stop Paul Manafort from killing all ostrich life on Earth. “Avenatti has proven himself to be a very compelling and watchable character, and we’re getting a FANTASTIC deal for sponsorship from NIKE, who intends to co-promote with a special line of jail-themed “Cellmates” sneakers”. As a public figure, Mr. Avenatti started out strong but suffered multiple setbacks in terms of remaining free to walk amongst us. This is possibly due to a series of poor choices when combined with cocaine. Michael Cohen started out as a villain, best described as “mildly concussed” but slowly realized he worked for the actual devil, a detail he would have noticed sooner if not for his aforementioned head injuries. 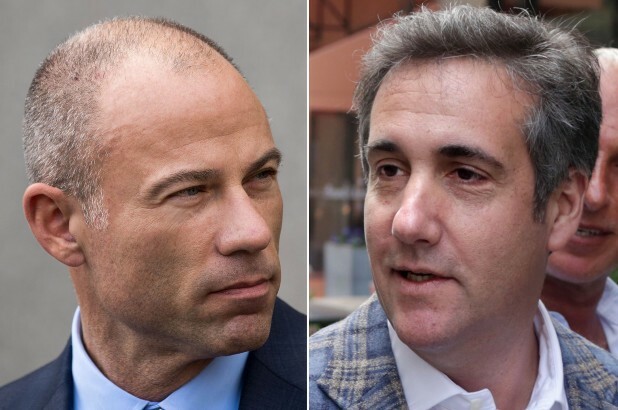 In the pilot episode; “Bail 2 Jail!” — Mr. Avenatti attempts to “sell” Mr. Cohen to a group of other prisoners in exchange for a carton of cigarettes. Hilarity ensues! They soon realize they have more in common than they originally thought when they both get tasered by over-enthusiastic guards and pee a little while convulsing with electric current. Ever since the demise of NBC’s “Community”, it’s been assumed televised comedy is over, an assumption NBC hopes to dispel. So, EXCITED about Avenatti, a one-time momentary contender for high powered political office, joining the comedy revolution inspired by Donald Trump (and “that thing” Trump calls “his head”)? Will YOU attempt pulling some cockamamie nonsense in order to enter the sights of the public eye in hopes to land an episodic prison-show of your own? Let us know in the comments below! FUN FACT: Every time you give a round of applause at the bottom of the page of one of my stories, I literally leap up and take a bow. True story. If You Follow Me, I Will Lead You Into Nonsense.